Home » Events » Learn how to solve disputes in Thailand! Learn how to solve disputes in Thailand! 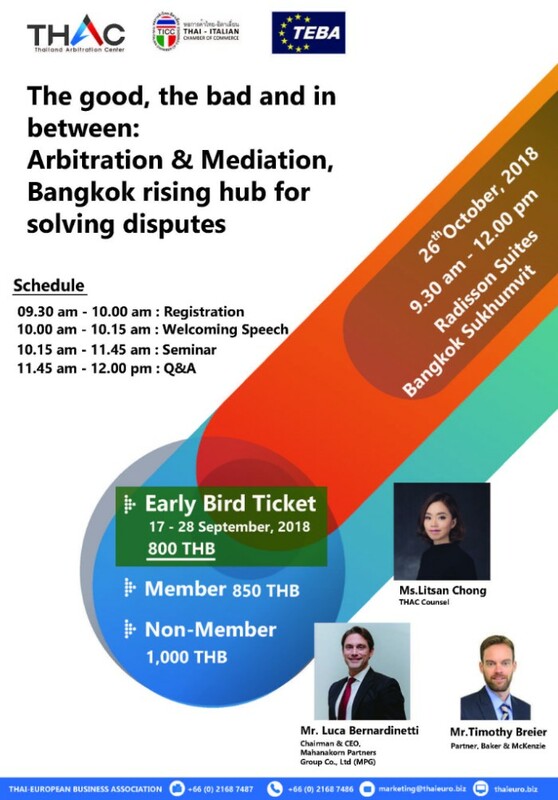 Thai-European Business Association (TEBA) along with Thai Arbitration Center (THAC), and the Thai-Italian Chamber of Commerce (TICC) would like to invite you to attend a seminar: “The good, the bad and in between: Arbitration and Mediation, the role of Bangkok as a rising hub for solving disputes”. This will be held on Friday, 26th October 2018 at 09.30 – 12.00 hrs, at the Event Room, Radisson Suites Bangkok Sukhumvit Soi 13The workshop will be interesting to anyone in the industrial manufacturings sector as well as any smaller companies as you will gain an beneficial insight into what can be done in Thailand when faced with a dispute and what can be the best way to legally mediate it. Especially with the lack of clear information in English in Thailand in the legal world, this seminar aims to answer basic mediation needs as well as jump start the understanding of arbitrating and mediation in Thailand.